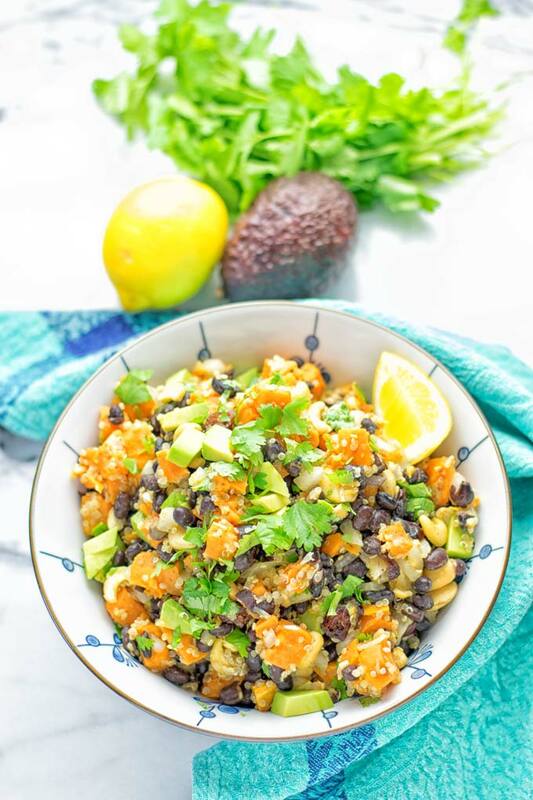 This Citrus Quinoa Sweet Potato Salad is naturally vegan, gluten free, and super easy to make. It comes with the best citrus dressing you can ask for and is always exciting with many optional add ons. Can you already feel and smell it? Yes, summer is in the air. 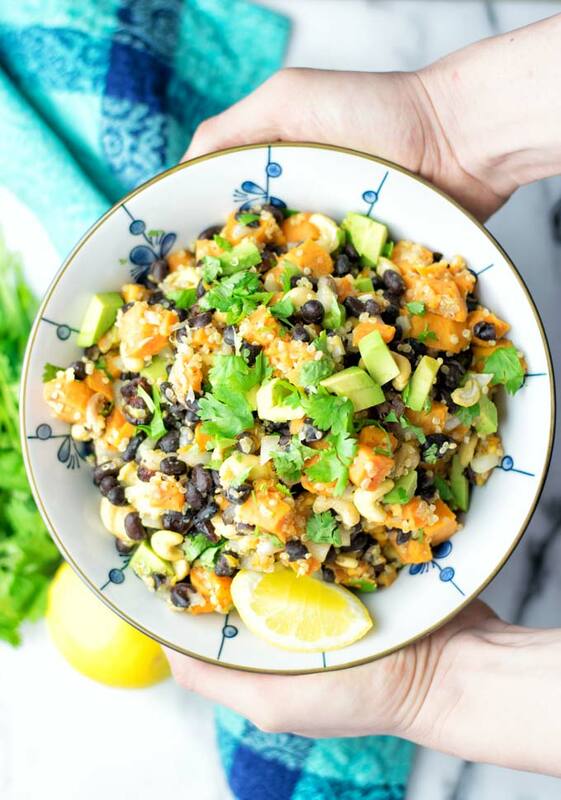 In this time I’m craving big plates of salads like this Quinoa Taco Salad [vegan, gf]. There is always something to do for everyone of us in summer time. You might chilling at the beaches, go for a walk, or plan some picnics or potlucks. Maybe you go for a bike ride, or something else. 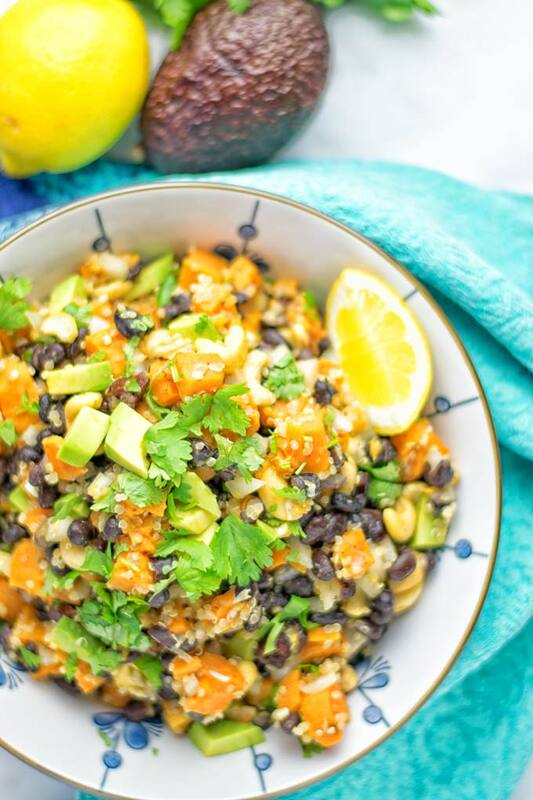 No matter for what adventures you’re going, you need this Citrus Quinoa Sweet Potato Salad in your life. It is a valuable companion to all your excitement and adventures. From the first bite you know it’s one amazing portable lunch, to go for potlucks, picnics and more, satisfying, really delicious, refreshing, healthy, protein rich, hearty, filling, customizable, and so easy to make. For 3 cups quinoa you will need 1 cup uncooked quinoa. And you will need one part quinoa and 3 parts water to cook quinoa. One thing that many people want to know is the cooking time. It depends a bit on the brand of quinoa that you have. It can be typically between 8 to 12 minutes. To be sure please check it out before cooking. 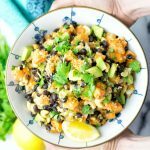 I mentioned before this Citrus Quinoa Sweet Potato Salad is absolutely amazing for all your picnics, potlucks, and of course BBQs. I find it’s very filling on it’s own. Especially if you choose some of the optional add ons. But it’s lovely with some grilled veggies, tofu, tempeh, or something else from the grill. It will compliment almost everything. Starting with washing the sweet potato under water. Rub them, and clean them carefully. Do not skip this step, you need to clean them in-depth. Now you can do two things: you either peel them or keep them unpeeled. What you go for depends on your own taste. Cut the sweet potatoes into cubes and put them on a baking sheet prepared with parchment paper. You can rub the cubes in a bit of oil, season them with a pinch of salt and pepper, if you like. Bake them for around 25 minutes at 415°F. Now let’s make this amazing salad together. 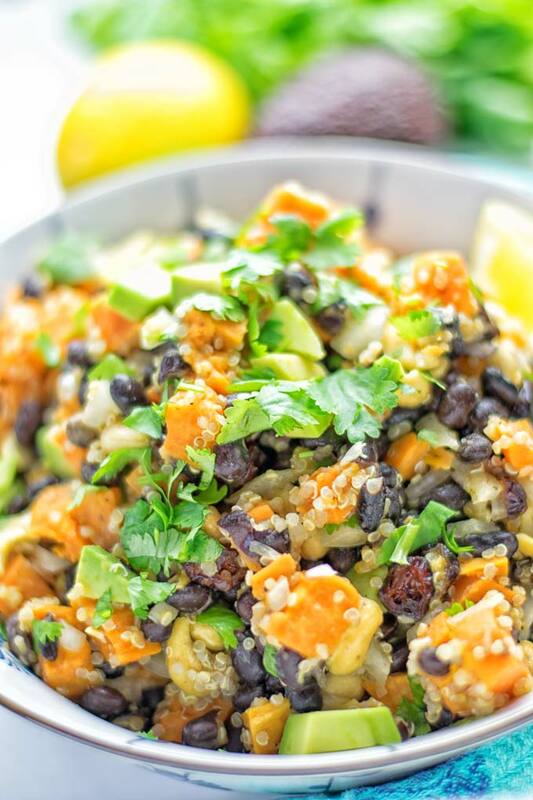 Combine the cooked quinoa and roasted sweet potatoes in a bowl. 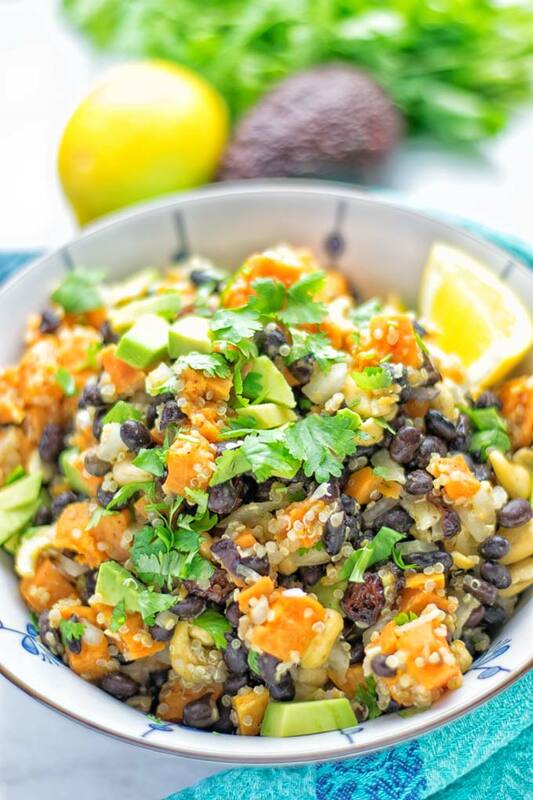 If you use optional add ons, like black beans, garlic, dried cranberries, onions, cashews, walnuts, parsley, or cilantro, add them to the bowl too. For the dressing: combine mustard and maple syrup in small bowl with the orange and lemon juices. Combine everything well with a wire whisk. Last give the dressing over your salad and mix everything in that bowl. Divide into plates or bowls, enjoy. This makes an amazing diary free lunch, dinner, or even side dish. It’s so refreshing and packed with fantastic flavors. Everyone will have a soft spot for this in no time. If you serve this, not only plant based folks but even the meat or picky eaters will hang on those flavors for real. 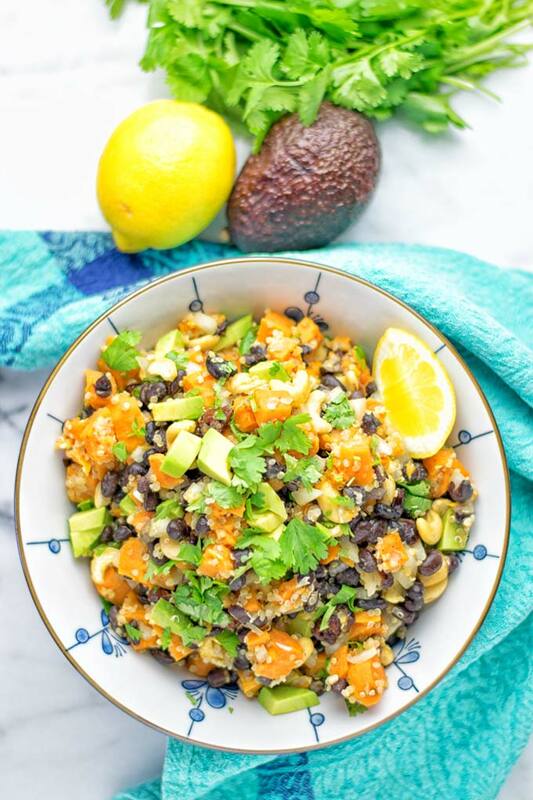 If you give this Citrus Quinoa Sweet Potato Salad a go, tag me on Instagram and Facebook with a picture. I love seeing all your remakes. Enjoy your summer adventures, Florian. Are optional ingredients included in the nutritional calculations? Hi Beth! The nutrition info is without any optional ingredients! Great recipe, especially the dressing. I didn’t have time to roast the sweet potatoes, so boiled instead…still turned out fantastic. I added black beans, green onion, shredded carrot, and dried cranberries. Was very colourful and quite delicious. We ate it while the quinoa and potato were still warm and again the next day cold from the fridge. Thanks for your amazing feedback, Christina! I hope you’ll find lots of more recipes to try!